How can I make my Bougainvillea bloom like it did when I bought it? 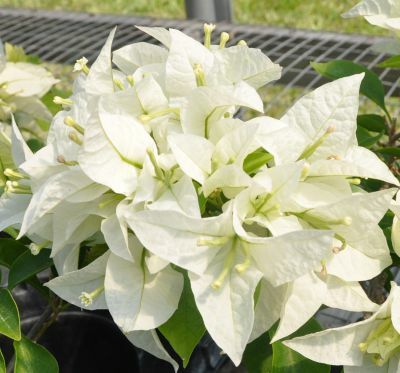 In our climate zone (lower zone 8), Bougainvillea bloom best if grown in pots and located where the roots cannot grow out the pots into the ground. If the vigorous roots are kept restricted the plant should bloom well even though it is still small. 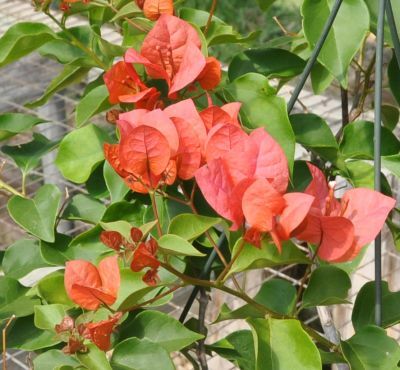 Bougainvillea can be kept indefinitely in 10" to 16" pots. Bougainvilleas prefer heat and plenty of sun. Grow in mostly sunny location. At least six hours per day of direct sunlight is necessary for good blooming. Protect from high winds. Freezing temperatures in the winter will damage or kill plants. 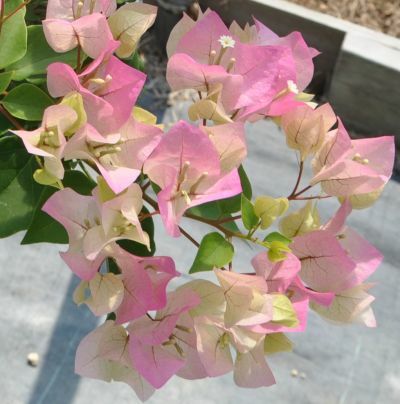 Bougainvillea should be fertilized at least once every six weeks or after each bloom cycle or after pruning. Balanced fertilizers are best. Use of soluble liquid (20-20-20 or 20-10-20) fertilizers requires more frequent fertilizing (at least once a week). A good slow release or timed release granular (like 18-6-12 Osmocote) works well, with the added advantage that you won't need to use it so often. If your plant has lush green growth but no, or very few, blooms it is possible that you are over fertilizing or over watering or both. Quit fertilizing for a while and grow your plant a bit on the dryer side until it starts blooming again. 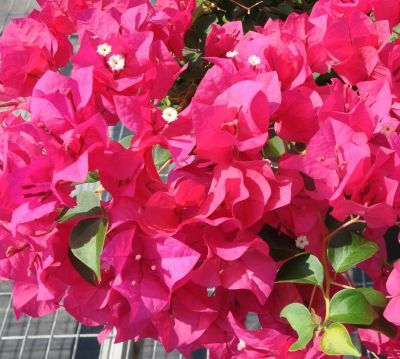 Bougainvillea should be kept evenly moist. The soil should be allowed to dry somewhat between waterings. Do NOT keep soil soggy. Slight wilting does not harm plants, but do not allow plants to wilt severely. When the plant is dry be sure to water well allowing some to come out of the drainage holes of the pot. It is important to note that you should not allow your plant to wilt severely when blooms appear; this may cause the bracts to drop prematurely. Aphids and worms are the major pests of Bougainvillea. Orthene or Thiodan mixed with a small amount of liquid dishwashing soap as a spreader/sticker controls both. A spray containing Neem is effective against aphids. 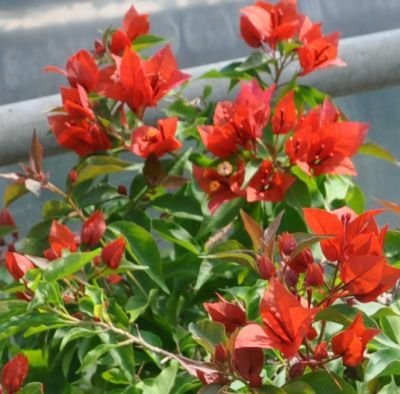 Disease problems are rare with Bougainvillea. Root rot can be a problem if the roots are kept too wet and not allowed to dry somewhat between waterings. If you have a heated greenhouse that is the best place to put your bougainvillea for the winter. Set your thermostat at 40 degrees or above. Be sure to check your plants in the greenhouse regularly since it will get very hot in there on sunny days even if it's cold outside. It may be necessary to open the door a bit and maybe even a vent to let the excess heat out on sunny days. As I mentioned above you may prune your bougainvillea severely when you put it away for the winter to save space. Don't be surprised to see your plants grow and bloom after a while if you don't have your greenhouse heavily shaded. You may need to water it occasionally. Just as in the summer, when it dries out, water it well. Don't bother to fertilize it during the winter - wait until the weather warms a bit. Start fertilizing again in late March or early April at the earliest. If you don't have a greenhouse you can store your plant anywhere where the nighttime temperatures don't fall below freezing. Try to find a place where there is at least some light. You really don't want to store it in a closet. Even then you may need to water your plant every now and then. Don't let it dry completely nor keep it soggy. In the spring, when the temperatures start to rise place your plant back outside in the sun. Watch the weather forecasts - if a late freeze is forecast bring your plant back in for the night and put it back out the following day. If you stored your plant in a place where the light was low the leaves may exhibit some burning and scorching from the sun. Don't be concerned about that and don't water it more often than usual. As the outside temperature rises the damaged leaves will fall and healthy new ones will replace them as long as you fertilize and water your plant properly. You may be astounded that a plant can provide so much concentrated color if you follow these simple steps. Use care when transplanting young/small plants. Bougainvillea roots grow fast but they are brittle. Until the plant becomes established the roots do not hold the soil together very well. Keep the root ball intact when transplanting. There is normally no need to wound or spread the roots when repotting unless the plant is severely rootbound. It will usually be necessary to cut the top back to compensate for root loss when root pruning. 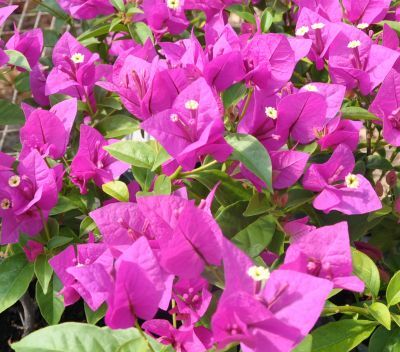 Some varieties of Bougainvillea bloom best during the short days of late fall, winter, and spring. Others are nearly ever-blooming. If a plant stops blooming prune it back and fertilize. Remember, they need plenty of direct sunshine! Mature Bougainvilleas that are growing well will bloom in normal cycles as long as temperatures are warm enough to promote growth. So enjoy!